Navigation on the RHÔNE is very fascinating with its constantly changing landscapes; its docks, nautical stops and various recreational MARINAS. It is a river of 812 km that takes its source in Switzerland altitude of 2209m and fell into the LAC LÉMAN to continue its journey through GENEVA. 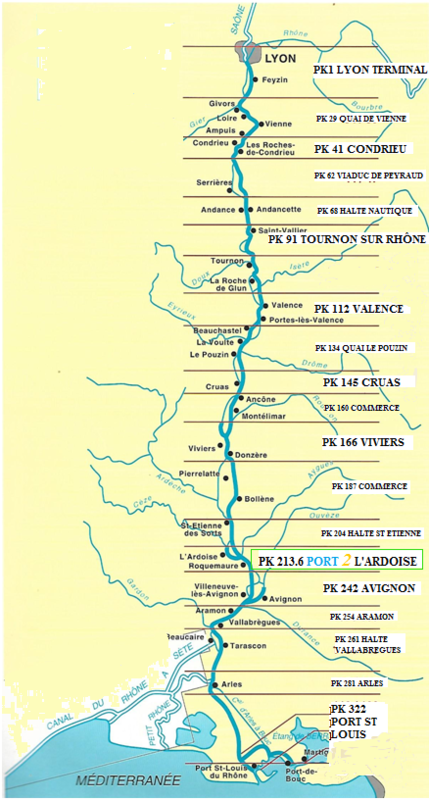 Two thirds of its length flows in FRANCE, it passes through LYON the region that bears its name, continuous towards CONDRIEU, LA LOIRE and under the bridge of ROCHES DE CONDRIEU, L’ISÈRE. It runs along the PILAT NATURAL PARK in ARDECHE, in front of the vineyards of SAINT-JOSEPH and CROZE HERMITAGE in the DRÔME. Passing VALENCE then MONTÉLIMAR with his specialty the nougats, he sometimes remains dangerous despite his channeling. If it is in light floods and exceeds 3,000m/second it is necessary to remain vigilant in DONZERE because the current can become violent and reach 15km/h. A rest can be taken while the BOLLENE lock the tallest (23 m) of all gets emptied. The hydraulic electric factory in CADEROUUSE adjust with her 5 doors the current and is avoided by the sluice. Going back 4 km to the PK 213.6, the RHÔNE feeds the fishermen who hide behind the greenery of this quiet part of the river. Well protected behind an insubmersible breakwater from floods and MISTRAL hides the small port of L’ARDOISE. On one side is the VAUCLUSE with ORANGE and its Ancient theatre and on the other side the GARD with NIMES and its Arenas. The boat cannot dock on the banks of CHÂTEAU-NEUF DU PAPE, but at the dock of AVIGNON passing under the BRIDGING BRIDGE «the BENEZET BRIDGE» It is divided in ARLES to BOUCHES DU RHÔNE for the SMALL RHÔNE which leads to the CANAL DU MIDI by crossing the NATURAL PARK OF CAMARGUE or go to SÈTE or continue to the last lock and the CANAL in PORT- ST-LOUIS, the last city before jumping into the sea. Coming from the NORTH SEA, the HANDLE or Baltic SEA, the RHÔNE is the necessary passage to cross FRANCE towards the SOUTH MEDITERRANEAN and then all horizons are opened in every direction. Sea navigation is another chapter. The return of Port2 to the initial destination can be accessed by BUS, TGV or LYON or MARSEILLE Airport. The Harbour office can recommend your itinerary according to your plans.